You're after a professional yet highly protective case for your iPad2. A corporate patent black leather case isn't your thing? And you're not after a funky red, pink, white or blue iPad2 case. The Case Buddy Companion iPad 2 case is just for you. Manufactured out of soft black and tan PU leather the CaseBuddy Companion is perfect for those who like a professional image sans suit and tie. Featuring a highly secure yet retro belt buckle fastening system there's no chance your iPad 2 0r new iPad 3 will slip out of this one. The soft micro-suede lining is gentle on your touch screen and assists in keeping it smudge free. Get an iPad 2 Smart Cover for far less than in shops! 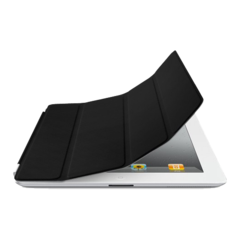 Made of PU Leather, Case Buddy Smart Covers provide your iPad2 with sleek, functionality protection that takes advantage of the magnetic off function to set iPad to hybernate. You can easily protect and use your Apple iPad with this stylish, unique, and functional smart cover. The German designed Kaufmann Bluetooth Keyboard Leather Case for iPad 1 and 2 is a protective case and has a detachable bluetooth wireless keyboard. The durable case offers superior protection, and is made of PU leather material. It also features a soft, scratch-resistant interior that unfolds for use with the keyboard. 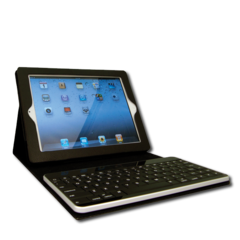 The keyboard and iPad 2 screen angle fasten securely with a touch fastener closure and can easily be adjusted. The Kaufmann features a tactile keyboard can be used inside or outside of the case, from up to 20 feet away from your tablet. It has a Lithium-ion battery that allows for up to 6-8 hours of use and recharges easily using the included USB cable. You can pair the detachable keyboard with other Bluetooth-enabled devices like an Android tablet, Android phone, iPhone or iPod touch. Suits iPad 1 and 2.